Do you own guns, and, are they sitting nicely nestled in a gun safe? 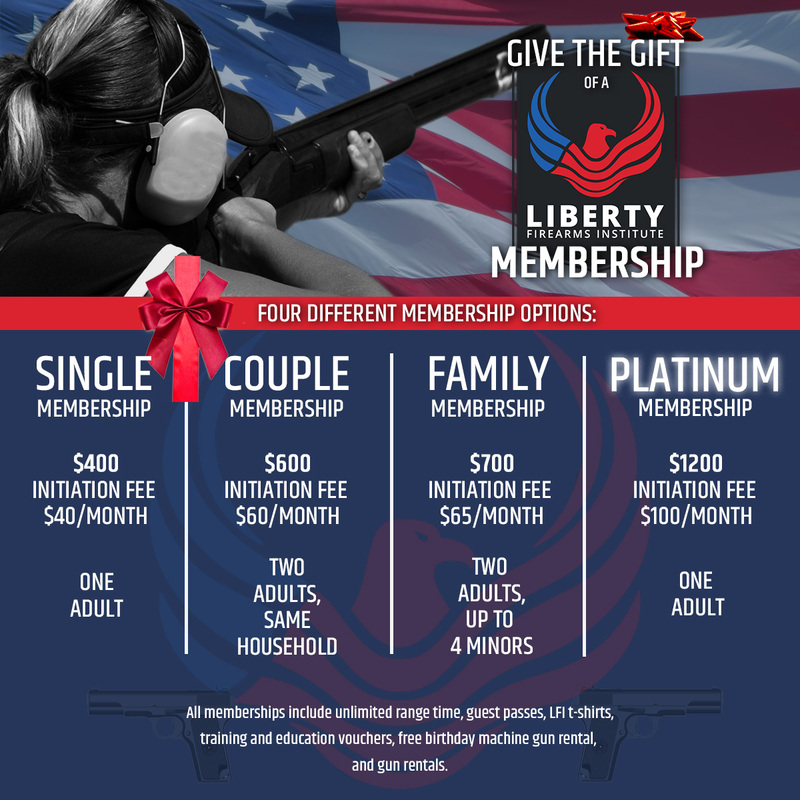 This is the perfect time to give the gift of a Liberty Firearms Institute (LFI) club shooting membership. Crack open your safe and practice your skills. Or, if a gun is on your wishlist this holiday, come in and try some of ours out in the indoor shooting range the meantime. LFI includes all standard range amenities, with walk-in lane rentals or ones that are reserved. You are able to choose from 25 or 50 yards, 100 yards, simulation/bobber, or archery. If you’d like to tour our facility before committing to a membership, ask about a free guided tour. LFI sets itself apart by providing its patrons with a state-of-the-art facility armed to educate and train all both beginners and experts alike. When you sign up for a membership, you receive hands-on education on the shooting range and in the classroom. Take advantage of archery classes, concealed carry, classes for women, classes for youth, hunter safety, and gun law seminars. Rent various types of firearms including handguns, long guns, gatling guns, and full auto guns. Why a club shooting membership? LFI is a wonderful shooting range for all ages and for those in all stages of firearm interest and experience. If you’re an expert, come experience one of the largest indoor shooting ranges in the US and hone or skills. If you’re new to firearms, LFI is a great place to take many of our classes and learn all about gun safety. Single membership (one adult) – This membership package is good for one adult and includes unlimited range time, including live fire simulation and bobber ranges. You’ll have the opportunity toty share your love of LFI with 12 guest passes. Other membership amenitiesinclude ana LFI t-shirt, one machine gun rental (25 rounds) on your birthday, $50.00 towards training and education, and one gun rental per year. Couples membership (two adults, same household) – This membership is great for couples wanting to further their range experience. Couples will receive unlimited range time, 12 guest passes, two LFI t-shirts, two birthday machine gun rentals, two $50.00 vouchers for training and education, and two gun rentals per fiscal year. Family Membership (two adults and up to four minors in one household) – The family membership for a family activity and to teach your kids all about gun safety. This membership includes unlimited range time, 12 guest passes to share your love of LFI with others, two LFI t-shirts, two birthday machine gun rentals, two $50.00 vouchers for training and education, and two gun rentals per year. *All minors must be accompanied by an adult on the range at all times. Platinum membership (one adult) – This membership is similar in the amenities of the single membership with the addition of access to the executive lounge, 24 guest passes, four LFI t-shirts, vault room rental, and free private (person-to-person) transfers. A LFI membership is a great way to get out of the house and learn, or brush up on your firearm skills. Take advantage of our indoor facility during the cold, winter months and become a better marks person for next years hunting season. Call LFI for your membership today!